The Kovac Planetarium in tiny Monico is one of those hidden Wisconsin treasures and the focus of a new book by Ron Legro and Avi Lank. 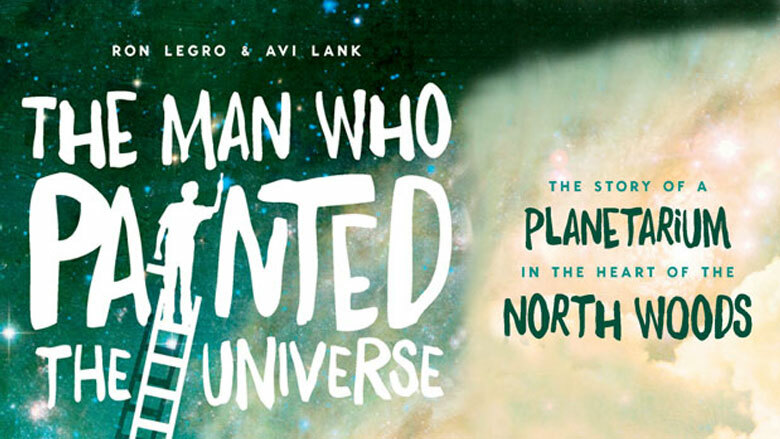 Legro and Lank are experienced writers and editors from Milwaukee, and their book, The Man Who Painted the Universe: The Story of a Planetarium in the Heart of the North Woods, reflects their skill as both storytellers and chroniclers of how one man’s dream became reality. Against this backdrop, Legro and Lank paint the portrait of an optimistic, determined man who, above all else, wants to share his love for and knowledge of the cosmos. At the age of 19, when most young men are pursuing girls or saving money for a car, Kovac spent his savings on remote patch of property near Monico, Wisconsin (just off of Highway 8 between Rhinelander and Crandon). Kovac worked jobs in Illinois and northern Michigan, eventually landing a career in the Air Force where his mechanical skills and creativity served him well. When he finally moved to rural Monico, he had the ability and determination to pursue his dream project: a mechanically rotating globe planetarium in which visitors could sit and see wonders of the night sky. Other unforeseen setbacks and challenges make for entertaining reading, but, overall, the reader is impressed by Kovac’s determination. The final step of the project was perhaps one of the biggest challenges in building the planetarium. In a beautiful combination of art and science, Kovac spent five months—from January to May of 2003—painting the night sky as it is seen above northern Wisconsin onto the interior surface of the globe. Remarkably, note Legro and Lank, Kovac often painted from memory, taking breaks to go outside and peer up at the night sky to check his work. Professional astronomers who have visited the Kovac Planetarium remark on its accuracy. To this day, Frank will climb a ladder and touch up his night sky with dabs of luminous paint; adding and taking away stars, or adjusting their brightness, to reflect new astronomical discoveries. The Kovac Planetarium, which today welcomes thousands of visitors each year, is a testament to one man’s determination. Amateur astronomers and lovers of the weird and wonderful will appreciate Legro and Lank’s thorough research and interviews with Kovac’s family, friends, and neighbors as they pursue the mechanism that drives his passion. The Man Who Painted the Universe: The Story of a Planetarium in the Heart of the North Woods includes photographs chronicling the construction process of the planetarium, which are helpful and interesting visual aids. Like the Kovac Planetarium itself, Legro and Lank combine science and art and create a piece of work everyone can enjoy and appreciate.